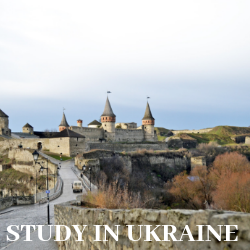 Study in Ukraine : Why Ukraine? Ukraine is the second largest country in the European continent situated in Eastern Europe with its capital city being Kiev which is also the largest city. Quality education at an affordable cost has put Ukraine at the top of the list of popular student destinations. Being declared as a Republic country, Ukraine is made up of a total of 24 provinces. It enjoys a temperate climate characterized by mild summers and extremely cool winters. It has a well-developed industry sector with special importance to space exploration allowing the country the pride of its space agency, the National Space Agency of Ukraine (NSAU). Tourism and nuclear power forms the heart of the country along with a high percentage of other resources such as coal, natural gas, etc. The mode of transport is concentrated majorly on Railways which connects the various cities of the country. While not the best regarding comfort, they are relatively cheap, will allow you to travel the entire country with ease. The official language is Ukrainian although Russian is used the most by the local population. The predominant religion is Christianity with few Muslims and Jews. The official currency is Ukrainian Hryvnia (UAH). 27 Hryvnia is around 1 USD. Cultural diversity is rich here with a mixture of ethnicity including Russians and Romanians. Affordable quality education offering degrees recognized worldwide. Personal development and a broad perspective due to rich cultural diversity. Ample job opportunities complemented by high standards of living. International Class Faculty who give more importance to the practical side of teaching. Ease of admissions and excellent transport facilities within the country. Visa process is easy and lot easier to get student visa. Tuition and Living costs in Ukraine are quite low as compared to other countries. Your tuition fess (Bachelors/ postgraduate) will be around $5000/year and Living costs will be ~$2000/year (average living life). Cost of MBA programs is little higher around ~7,000/year. It is the top-most prestigious public university in Ukraine known for its research facilities and the largest number of academic programs. Bachelor's, Master's and Doctorate degrees are offered in various fields of education such as Science, Technology, and Literature. This University offers highly skilled Faculty to impart practical based education to the students. Students are provided with abundant opportunities through the University's exchange programs and tie-ups with reputed research institutes. It is a top notch public university in Ukraine well reputed in the fields of Management, Technology, and Economics. Students are offered specializations in several fields at the undergraduate, graduate and postgraduate levels. Up to date research facilities and good faculty add more value to the education meted out by the University. It is the oldest public university in Ukraine with its reputation still highly ranked. Students are offered degrees in various fields of Science, Journalism, and Technology at all levels. The student population is diverse and excellently guided by expert faculty members. The various research divisions such as the Institute of Archaeology and Institute for Historical Research encourage students towards a complete and fulfilling education. It is the first technical university in Ukraine, one which still stands strong among the present top universities. Bachelor's, Master's and Doctorate degrees can be pursued here in various fields of Science, Technology, and Engineering. Only the best Faculty members have been put together in this University to train students in their various fields of interest. Students are provided with the exposure required for a fulfilling education experience through the University's tie-ups with various Universities and research organizations all over Europe. Ukraine offers international education with a European flavor making it an ideal destination for students who want to pursue their studies abroad.